Product update 5.8 introduces a new, practical way to break down work precisely using runtime policies. 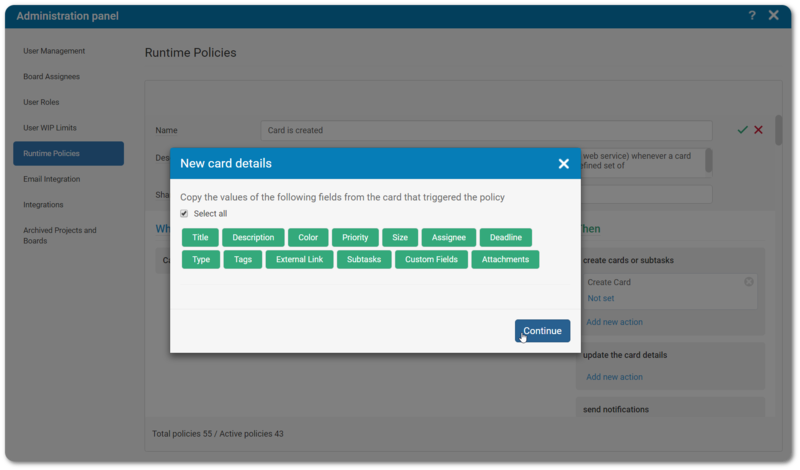 Whenever you set up a policy that triggers the creation of new cards (including parent, child and relative cards), you can copy card parameters of interest from the trigger card to the newly created one and manually fill the fields that you need to be different. This way, you can set up the creation of very specific work items without having to fill in recurring parameters by hand, which can be the perfect hack for setting up Portfolio Kanban when tracking the progress of your team on a Master Board. In order to make use of this feature, open the administration panel and go to the Runtime Policies tab. Select any policy that allows you to automatically create cards as an action (“Card is created”, “Card is updated”, “Card is updated by email”, “Card is moved”, “WIP limit is reached”, “WIP limit is exceeded”, “Card Count”). Set up the trigger conditions then the action of creating a card whenever they are met. After selecting where you want the new card to appear, you’ll be asked to select which parameters of the trigger card you want to be copied to the new one. 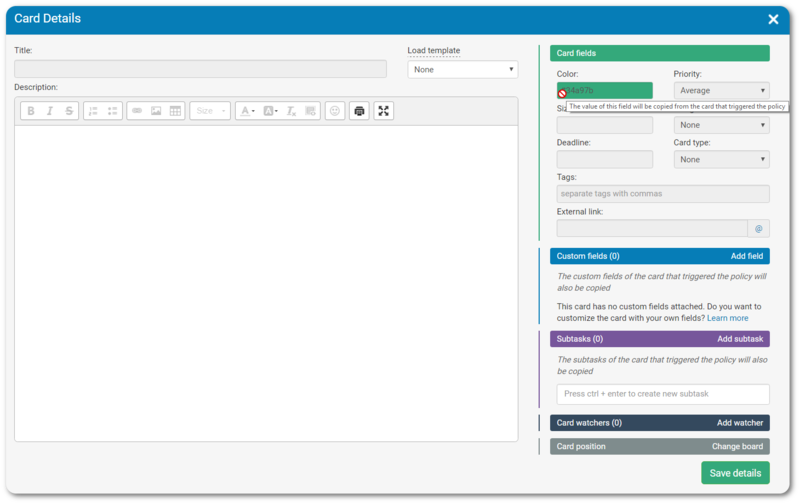 Afterward, you’ll be able to see how the newly created card will look and to manually fill in specific information in every field that will not copied. When you are finished, just save the details and activate the policy. Last month, we introduced you to a shiny new feature – SAML 2.0 Single Sign-On. Now it’s time to make that mobile! This month’s update gives you the option to log in with SSO from our iOS and Android apps. On the login screen, you will find a new button called “Using Single Sign-On?” Clicking it will take you to a new screen where you need to enter your Kanbanize subdomain. For example, if your Kanbanize account is hosted at https://awesomecompany.kanbanize.com you need to type awesomecompany into this field. Select the “Go to SSO Login” button. You will be transferred to your Identity Provider’s login page. 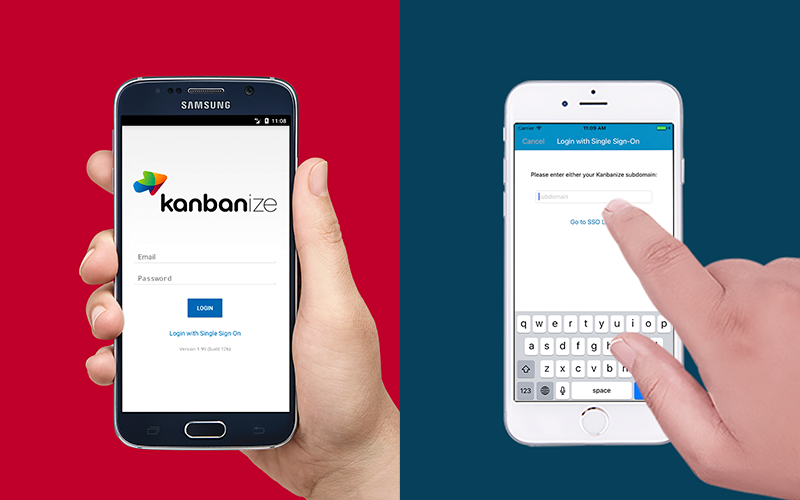 Type in your credentials and access your Kanbanize account! Please note that in order to use this feature, SAML integration should have been configured for the account beforehand. 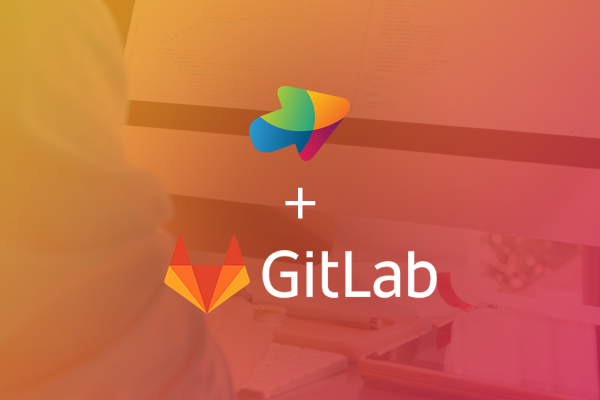 Product update 5.8 brings a new powerful integration between Gitlab and Kanbanize. With its help, you can track commits as comments in a corresponding Kanban card as well as to keep a close look on GitLab project issues as cards in a Kanbanize board. The integration works in a single direction, which means that activity in Gitlab will trigger actions in Kanbanize, but won’t work the other way around. When you’ve got a huge amount of tasks that pass through your workflow every day, finding a specific card may prove to be surprisingly difficult, especially when there are many assignments that match your search criteria. Now, the last inspected card in the results window will be highlighted in yellow so any user can differentiate between recently searched results more easily. Another navigation enhancement allows you to remove and arrange the search criteria of your query in the order of your choice using the Configure Results button in the top right corner of the results window. There, you’ll notice that there is a number on each criterion representing its position in the results page. Deselecting any of the pills will move up the order of the other criteria. Selecting a new criterion will tag it onto the end. 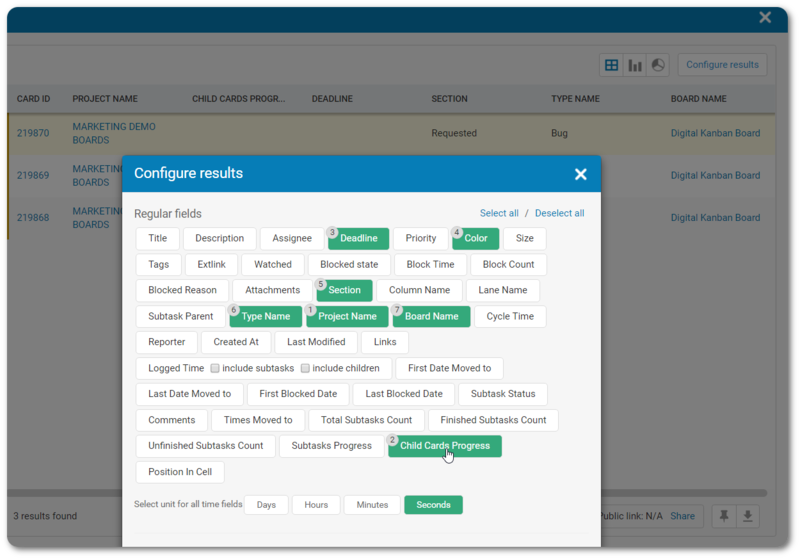 With their help, you can search for all the child cards by the parent’s name, ID, and every other available parameter. 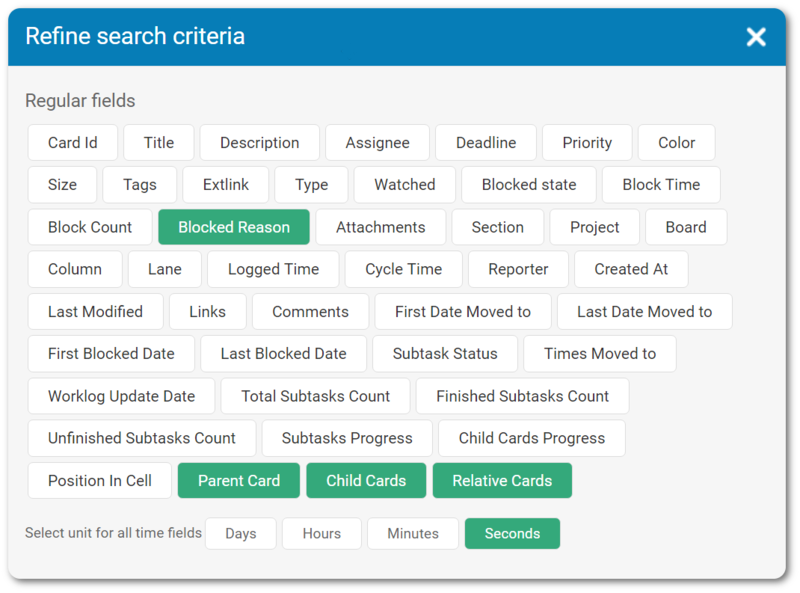 The new search options will allow you to generate advanced reports about child cards progress and present data to stakeholders in precisely structured tables that are easy to understand as well as generate highly customizable widgets. With the introduction of product version 5.8, you are no longer limited to importing new cards in Kanbanize. You can update existing tasks when importing xlsx. tables with just a few little adjustments. 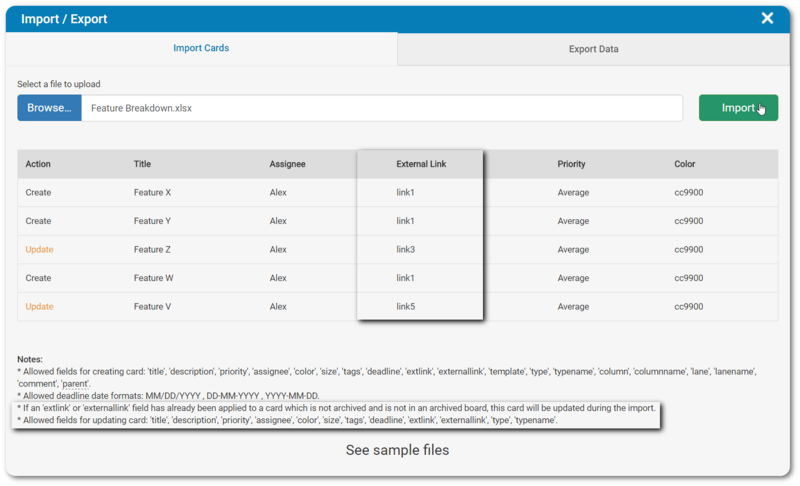 When you structure a table, you need to match the external link field of the cards in the list for importing to the existing cards you want to update. It does not necessarily need to be a link. For example, if you want to update a card with an empty external link field, you just have to type in any text (e.g. link1) and put the exact same content in the xlsx. table that you are importing. To update a card this way, you need to make sure that the information in its external link field is not matched in any of the other existing cards. Once you’ve selected a xlsx. file to import, if the condition for updating a card is met, the system will ask you to confirm your intention. Afterward, you’ll be able to see a list of the cards that will be imported. The ones that are going to update existing cards will be highlighted in orange.